One of the best devices made for baseball or softball defensive practice, Cimarron Sports' Pitchback Pro is a must-have for any ballplayer. Balls rebound off of the net back toward the thrower as line drives or grounders, all depending which part of the net the ball is thrown to. So, not only is it great for perfecting throwing accuracy, players practice their fielding skills at the same time with each throw. No, this isn't the cheap kind of pitchback net you can find at your local WalMart. The Cimarron Pitchback Pro features a sturdy 1.5 inch, 18 gauge galvanized steel frame and super durable, 100% weatherized nylon netting. Bungee tie-downs create the springback instead of the cheap springs that, stretch out, lose their spring and rust that you will find on cut-rate pitchback nets. In fact, there are no screws, nuts or bolts on the Pitchback Pro to rust, either! Best of all, this not just a one player defensive drill net. Both sides of the 48" wide x 68" high Cimarron Pitchback Pro can be used simultaneously, providing a full 39 feet of throwing area. It's unique dual sided design makes it virtually impossible to tilt over! THE CIMARRON GUARANTEE: Cimarron Sports guarantees 100% satisfaction with your Pitchback Rebounder. Products may be returned for a refund within 31 days of the date the product was shipped to you, when returned in accordance with the Cimarron Sports policies outlined in the Shipping & Returns section of this website. WARRANTY: Cimarron Sports warranties this rebounder with a minimum 1-year limited warranty against manufacturing, materials, workmanship defects. We will enthusiastically replace or repair your product at our discretion. For full details, please read the Cimarron Sports section of the Shipping & Returns page. No matter where you order a Cimarron Pro Pitchback Rebounder from, NOBODY actually stocks them; they all ship directly from the manufacturer's warehouse located in Tulsa, Oklahoma. Therefore, the shipping time frame is exactly the same no matter what website you order from (we hope that it is this one!). 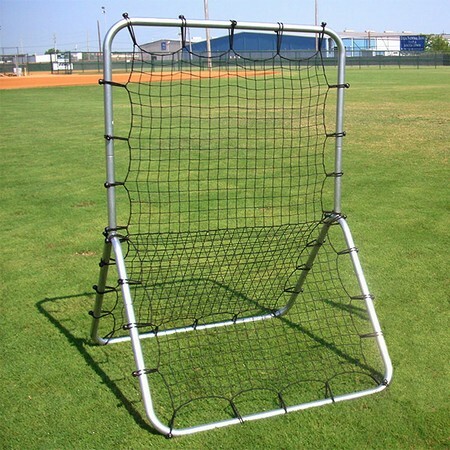 Pitchback Rebounders typically take 3-5 business days to ship from the time you place your order. They ship via United Parcel Service (UPS) and could take anywhere from a day or two to a week to get to you AFTER being shipped, depending on your proximity to their warehouse. We will notify you of your tracking number the moment we receive it from the manufacturer's warehouse. Click here to download an easy to read, printable PDF of the Cimarron Pro Pitchback Rebounder Owner's Manual.